The okapi (Okapia johnstoni) is a Central African herbivore that lives in the dense rain forests of the northeastern region of the Democratic Republic of the Congo -- formerly Zaire. The okapi is the only living biological relative of the giraffe. It looks like a short-necked giraffe with a dark-brown coat and white zebra-like stripes on the legs and rump. Okapi have large ears to catch every sound that might mean danger. Okapi are browsing folivores, meaning they feed on foliage. They use their 14-inch-long, blue-black prehensile tongues to strip leaves from understory shrubs and brush. They eat leaves and fruits from more than 100 kinds of rain forest plants, so there’s always food available. They typically eat 40 to 60 pounds of leaves a day. They’ll also nibble at clay and charcoal to obtain minerals. A female may travel more than a half-mile a day in search of food, mostly along paths used by generations of okapi. A male okapi can travel more than two miles a day, feeding and scent-marking its territory to warn off other males. An okapi stands about 5 feet tall. Females are heavier than males, weighing 500 to 770 pounds. Males weigh 440 to 650 pounds and are slightly shorter than females. Males have short horns covered with hair, like those of the giraffe. Females lack horns. Okapi live up to 30 years in captivity. They are solitary animals, living alone except during mating season or when an adult female has a calf. They are very wary and secretive. Their color and markings allow them to blend into the background of the rain forest underbrush. Okapi have a low reproductive rate. They become sexually mature at around 2 to 3 years of age. The gestation period is about 15 months, and there normally is only one calf. Weaning takes about a year and the calf may stay with its mother for another two years. Calves are about 2 1/2 feet tall at birth and weigh around 35 pounds. Newborns can stand within 30 minutes and will start to nurse within an hour. For the first two months, okapi calves spend most of their time hidden away in vegetation, with the mother visiting only to feed her offspring. By 2 months of age, the calf will have tripled in size and be ready to accompany its mother while she feeds. Estimates of the wild okapi population range from 10,000 to 35,000 animals. Leopards are the only natural predator of adult okapi, but the African golden cat will take calves. 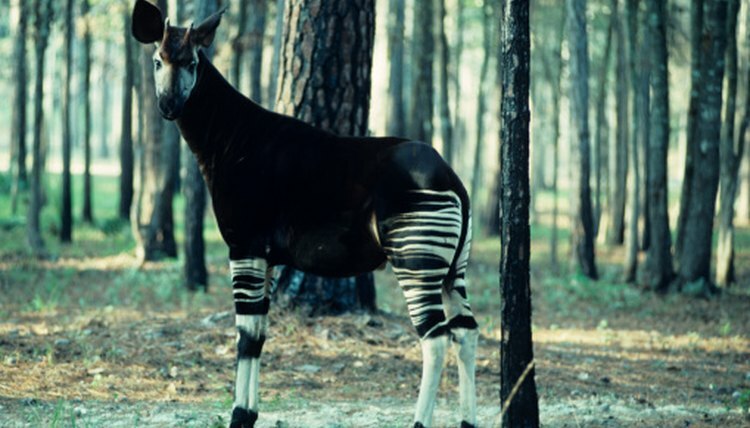 The biggest threat to the okapi is habitat destruction as humans clear the rain forest for timber and agriculture. Another threat is illegal hunting for okapi for their skins and their meat, which is considered a delicacy in some quarters.